The wait is over. 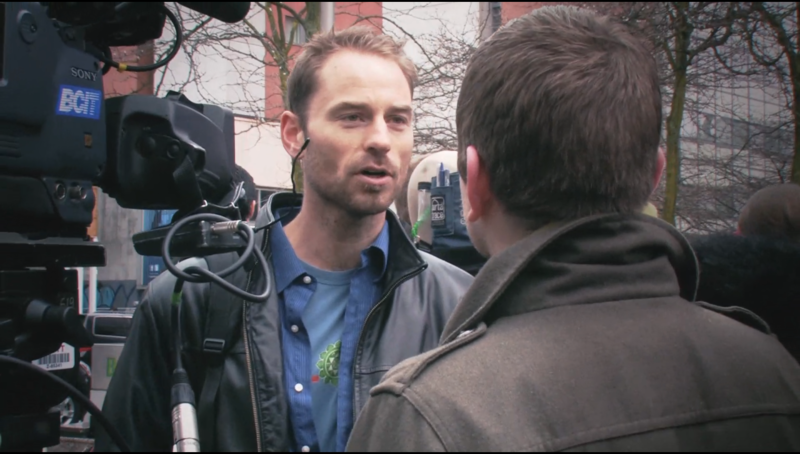 Watch the official film "Take Back Your Power 2017" for free, and get the cold, hard truth about smart meters. Watch it just above, or on YouTube here. My investigation started out simply enough. One of my good friends got sick suddenly and no one could figure out why. Then she realized that her electric company had installed a wireless electrical meter–a “smart” meter–at the same time she got ill. I did a little digging and found that my friend wasn’t alone. I found thousands of stories from regular people who had similar stories. I wanted to find out for myself if this was really happening. So, I grabbed a camera and traveled around the world. What I found was mind-blowing. I found a threat that starts at the highest levels of government, involves billions of taxpayer dollars, and benefits no one except the world’s largest energy companies. Looks harmless, right? I thought so too…. Scary, right? That’s not even the half of it. What’s so insidious about this new threat is how innocuous it seems on its face. Here’s how they sell it to us: A simple device, installed by professionals, designed to save you money, save energy, and eventually help save the world. Who wouldn’t want to be a part of that? If that’s what these so-called “smart” meters actually did, if all the promises were true, then anyone who cares about their families, their futures, and the future of the planet would be crazy not to get on the bandwagon. The facts, though, are clear. 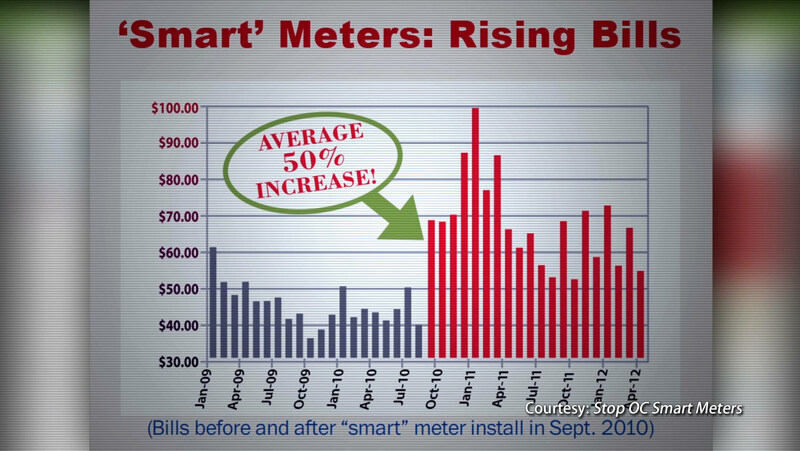 That’s NOT what these “smart” meters actually do. They are instead a full-fledged onslaught on your health, your privacy, your safety at home, your wallet, and your freedom to make the best choices for you and the ones you love. I made TAKE BACK YOUR POWER as a labor of love. The truth behind smart meters is something that affects A LOT of people at this moment and that will affect BILLIONS of us in the very near future. The US government alone has given over $11 billion to the nation’s largest power companies to roll the smart meter program out as quickly–and as silently–as possible. This is information you need. This is truth everyone close to you must have. The clock is ticking. It’s time to get informed. Above all, I have now made this documentary freely available – permanently. Watch it. Share it. Send this link to everyone you know. Our political ideologies don’t matter. Our personal belief system doesn’t matter. What matters is that we’re all in this together. It’s time to take a stand. It’s time for us to take back our power. In my country they are going to use the Local Government Act (councils) in each state to get smart meters in. They are going to send “energy” auditors into all homes to perform a ‘energy’ audit. If you have an ‘energy inefficient” device in your home they can (read will) (order you to replace it with a more efficient one (smart meter) If you don’t get one installed by a contractor and pay them for it then the council can move your home into their possession and become the legal owner of it. From there they can sell it to the highest bidder, take the contractors fee and their costs out of the proceeds and give you the left overs. How much left overs will there by when the CEO of the council can sell the home to business mate for less than half of what it was worth . The business mate can then sell it for full price and take half the money and give the rest to the council CEO. BTW, they can CO-OPT the police and INSTRUCT them to provide protection for the contractor, yes you will pay for that too. 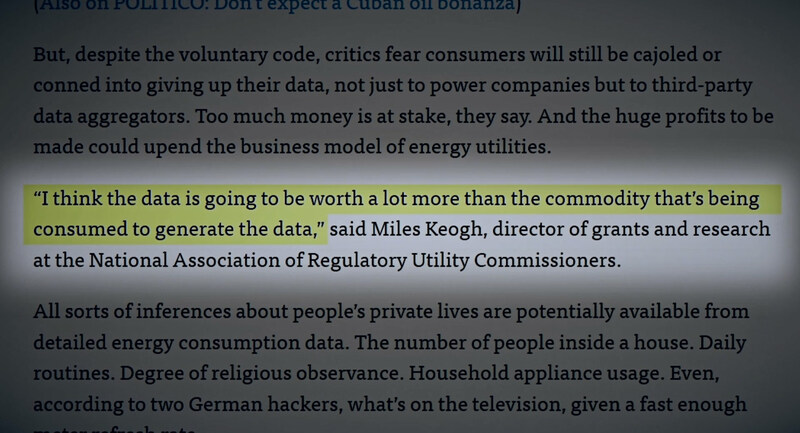 Kevin, thanks for that update of what utilities and government are brutally doing there – Australia right? ‘Smart’ meters and related initiatives comprise a scam of massive proportions being implemented globally in the name of climate action. In my view the agenda is still proceeding because people have not yet learned in mass that “it’s just business” and to play the commerce game correctly. InPower Movement is intending to shift that. What if I do not consent to having a smart meter installed at my property? Retailers are required to install smart meters for new connections (eg. a new build house) and if your meter is faulty or has reached the end of its life and needs replacing. If your meter needs replacing, you can ask your retailer to disable the communications functions. There may be additional costs associated with the retailer having to do manual reads of your meter if you choose to have the telecommunications disabled. If your current meter is working properly and a retailer wants to replace it with a smart meter, you can opt out of the smart meter installation. You can only opt out if you haven’t waived your right to opt out when you signed up to your current electricity contract. I rang Ergon back and politely asked for my conversation and request not to have smart meter installation recorded as a hard copy and for a hard copy reply. I was promptly told this wasn’t possible – of course I insisted and kept insisting until it was taken to the complaints department who finally relented and allowed a pre- written opt out acknowledgement letter be sent to me via post as I requested. This response only serves to make me more determined to step even further back from engagement with any kind of energy provider. It’s time to save for stand alone solar and wind on my property!! Good luck to all in the future. On 11th September 2001 the WTC was demolished ‘by hijacked airliners”. Remember that one ?
. Sure, makes such a lot of ‘sense”, to the arms manufacturers, and criminal Terrorist State of “Israel”. I was under the impression that by watching this, and/or looking at the website, I would get some good information as to how to proceed to get my utility company to remove/replace my meter. I have not found that. Did I miss is somewhere? I remember when the man was here telling me of plans to have one installed and I told him I didn’t want one. He said, Well you’re going to get one, whether you want it or not! 1) The website that is dedicated to the process of ‘smart’ meter removal, and stopping the ‘smart’ meter agenda, is https://InPowerMovement.com. 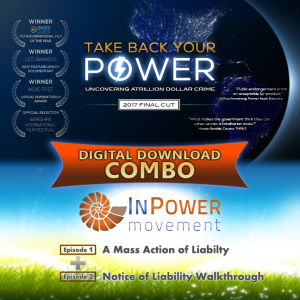 There you can watch InPower Episodes 1 & 2 of the docu-series, then either use the documents and guides (free) to do the Notice of Liability process, or sign up to InPower’s email list to be notified when their next phase launches. InPower’s next phase is making it into an automated process with full support and groups. 2) If you are looking for short & concise info about opt-ing out & dealing with your utility, please see my free guide, “5 Ways To Reduce EMF Exposure” — specifically, pages 10-12 on ‘smart’ meters. At the end of the video, it says to scroll down to the bottom of the page for step-by-step instructions – but I don’t see them anywhere on this site. Where are the instructions on how to prevent and/or undo smart meter installations? Sorry this isn’t as clear as it could be. How do I do the email and keep myself safe? (From The Netherlands) I recently sent a refusal of the smart- and digital meters by recorded delivery to my utility company. Their representative said that my meter must be replaced because it no longer met the statutary requirements (it was declared obsolete on the basis of random testing). I stated that if this was the case, I was prepared to have it replaced with another analogue meter, but this was basically ignored. Instead, I was informed that the utility company was only responsible for the rolling out of the meters and I was referred on to a higher authority. I was also informed that if I did not consent to the utility company’s next letter, a procedure would be instigated to cut me off! Any suggestions? I believe that magnets would throw the “smart meter” into a state of electronic Alzheimer’s. Get a hold of some scientist who might know how big a magnet you would need to install near your smart meter to take it out. I was told by the electricity distributor that it was “law” to have a smart meter and gave me in writing that they were going to cut off my energy in four weeks time. I insisted in writing (always, as you need proof) that they send me that “law” – after receiving and reading 60 pages of small print I knew that it was not a law! I contacted the ombudsman and send him all my correspondence in copy accusing the retailer of lying, bullying, blackmail etc. Although the website of the ombudsman told me that it was “law” to have a smart meter I stood my ground and still have my analog meter today – 6 years after the fight. It was a bit more complicated with me because I had solar panels installed, which the retailer insisted to have inspected which I did not allow as I had it inspected already cost free for me with the installation. Nobody read my meter for those six years and the bills I receive are about fair. When calculating the costs of batteries etc. to be self-sufficient, the costs are far higher than my bills, taking my age into consideration. I am 80 years old now. Arise Dame Brigitte! You really made a brave effort and it paid off so many others can too. Well done. do not see the 3 links that you say are at the end of the DVD to do something about this. 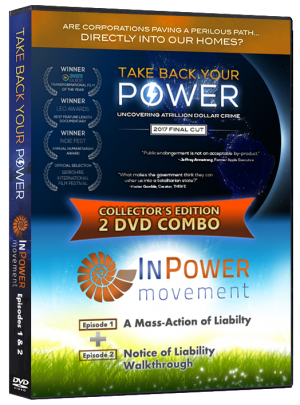 Hi Dawn, for the action steps as noted in the DVD and on YouTube, please sign up via https://InPowerMovement.com. The Notice of Liability process is available freely on the InPower site, and the next phase of automated document customization & group processes is in development. 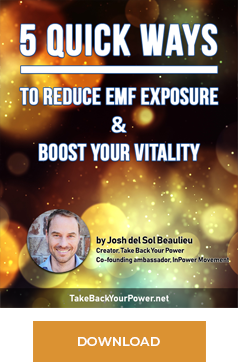 Also, we have a free PDF available which has a 4 page overview guide on dealing with your utility: https://takebackyourpower.net/subscribe-for-free-emf-guide/. 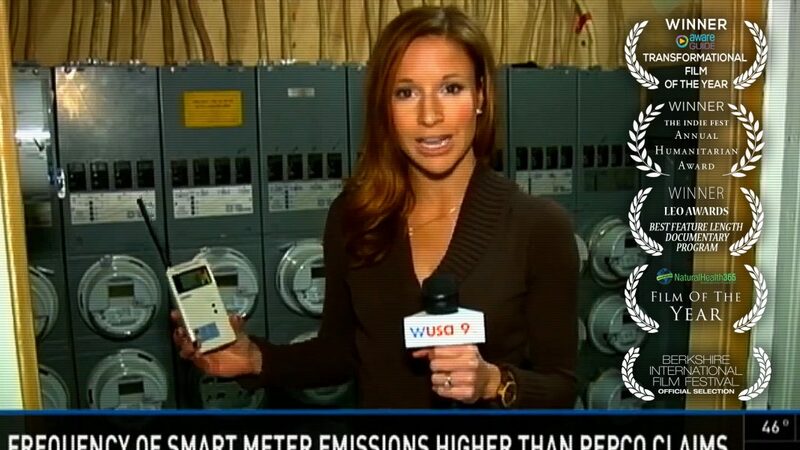 I truly hope and pray that this smart meter program will come to an end before it’s too late. I myself have one installed on my home as well. I didn’t want it but I was given no choice in the matter I had never had Vertigo before and I’ve had it 2 times in this last year. My bedroom wall is up against the smart meter…hum ??? Thank you for the information and I hope that everyone who watches it will help stop it. You could throw some emf shielding fabric around it. Or on a budget, wrap it tightly with plenty of tinfoil. I wept. The documentary will shake anyone with a soul. Josh is what SittingBull describes. Hats off to you. How do i access the documents? Where do I get the questionnaire, to hand to the power company who wants to check the status of my smart appliances and smart meter? may i send this out !!! We, in this area (Kaslo, B.C. 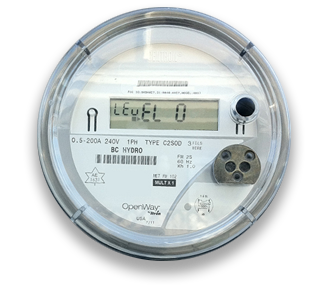 Canada) fought aginst the “smart meters” and were able to have our meters physically “read” for a fee of $9.00 per month. 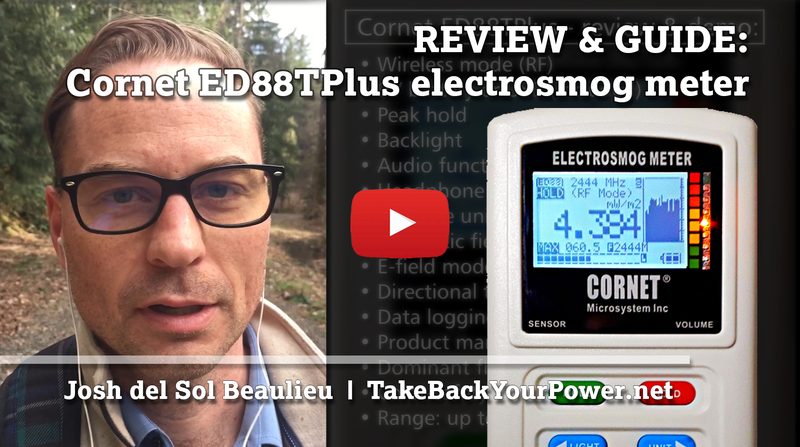 No more energy radiation on those homes/locations. No physical radiation. Josh, I have been all over your website “inpowermovement” and have made a donation and subscribed but I can truly say that there is no where to look at or download the NoL, no ‘documents and guides’ and no episodes 1 & 2 ??? The documentary was beyond amazing and as I’m the only person I know that is aware of the extent of corruption and what is ‘Revelation’ type scenarios that are upon us, it is the first time in a long time that I actually didn’t feel alone and in paralysing fear. So please get back to me to let me know where these things are hiding on your website!! Thanks so much for everything you are doing! Hi All, I’m living in south of France and in our beautiful country our smart meter has a pretty name called ” LinkY ” and is all “chlorophyll green” colour to make it more “green” and acceptable. There is actually a big fight between ENEDIS who is the provider of these Lucifer’s devices and hundreds of citizens organisations around the country who say “NO” to these ” LinkY”. Your documentary is great and I will try to take the time to add French translations if you permit me before to spray it all around the country via groups on the network. Many thanks for your good job and keep fighting. An outstanding documentary! Scary as it is; only commenting briefly to attest to its veracity. We live in Norway, and we’ve had smart meters in our building for a long time. In 2015, my husband, who always has been healthy, developed strange symptoms. He could not sleep at night; started sweating, getting palpitations and irregular heart beat. Some nights it was so bad he thought he was going to get a heart attack. Only after a year did a discover that in US, smart meters were said to emit frequencies that could influence human heart beat. I was skeptic at first, as I always am. We are both scientifically minded and highly educated. Then we remembered that the meters were changed, the frequency was changed, just before my husband experienced health problems. He changed the room in which he slept, and within a month or more, the symptoms abated and are now gone. The room in which he slept was within 16 feet of the new meter. The position of the bed was aligned with the position of meter communicating with the base outside. It still was difficult to believe that something that dangerous could be installed, but it is true. Also, they changed the outside lights to LED so bright that it is impossible to sleep. All digital technology disturbs our brain, as it is best adapted to the analogue. The LED technology hurts my brain, and is bad for anyone with photo sensitivity or proneness to seizures. The bulb is not glowing as in analogue technology, imitating the natural light, but emits pulses instead. This is supposedly saving energy, yet not the eyes as it is such a poor source of light. The light industry officials in the UK and other countries fought the EU on this artificial technology, to no avail. We now know about the Agenda 21, an extensive plan to exercise global governance through technological dominance and global experimentation. The plan is failing miserably, yet the victims are real. Thank you Josh! An amazingly well done film! I am a power engineer and I have been letting people know for years, that the power that runs through their walls is an unfiltered, unharmonized power that will make them and their appliances sick! That their power provider knows this but doesn’t care! And also, do not let them put a smart meter on your home as it will do 10 times plus the harm! I then tell them to shop online for EMF protection devices.